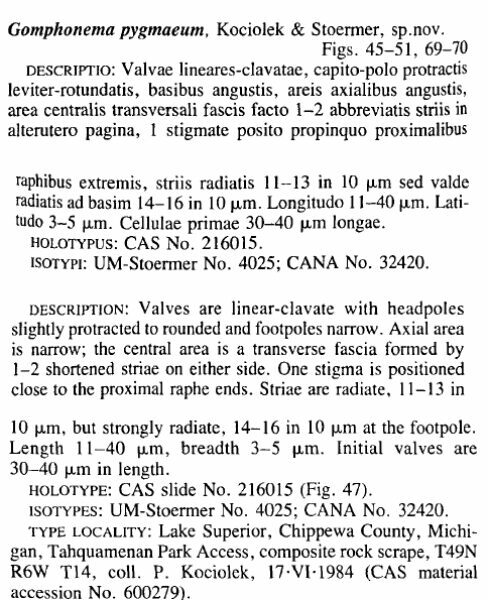 Valves are linear-clavate, with a squarish to rounded, protracted headpole. The footpole is rounded. The axial area is narrow, and expanded to form a transverse fascia as a central area. Striae are shortened on either side of the central area. A single, distinct stigma is present near the proximal raphe ends. The raphe is weakly lateral and slightly undulate. The external proximal ends are slightly dilated and rounded. Striae are radiate, near the center, becoming more strongly radiate at the footpole. 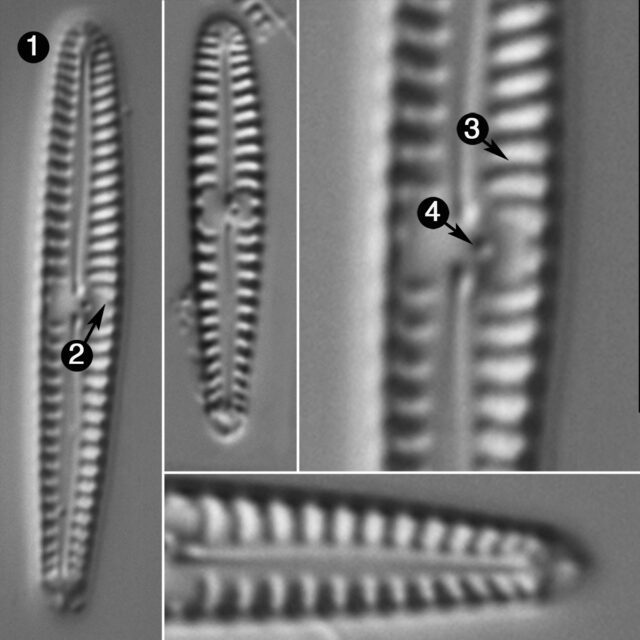 Under SEM, G. pygmaeum has C-shaped areolae and a round, unoccluded opening of the stigma. The proximal fissures of the raphe are dilated, while the distal raphe ends are deflected onto the mantle. The apical porefield is bisected by the raphe and formed by round, unoccluded porelli that are separated from the areolae by a hyaline area. Gomphonema pygmaeum was described from rock scrapes from the shore of Lake Superior. The specimens illustrated here are from Oregon, and it likely occurs in other regions of the country. Valves are small and narrow. Striae are shortened on either side of the central area, and striae may be curved near the central area. Single, distinct stigma present, positioned near the proximal raphe ends.